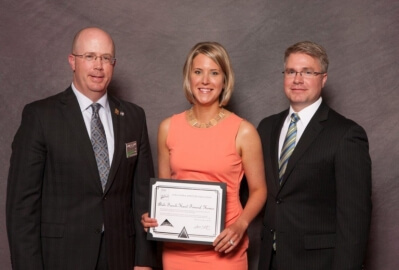 WEST DES MOINES, Iowa - Abels Funeral Homes of Grundy Center, Dike, Eldora, Reinbeck, and Wellsburg received the Award of Excellence in Funeral Service at the 135th Annual Iowa Funeral Directors Association (IFDA) Convention held May 12-14, 2015, at the Iowa State Center and Gateway Hotel in Ames, Iowa. The Iowa Award of Funeral Service Excellence recognizes a funeral home’s exemplary service to the community it serves. Abels Funeral Homes, which has been serving Grundy Center and the surrounding communities for over 100 years, was one of 17 funeral homes from throughout the state to receive the award. 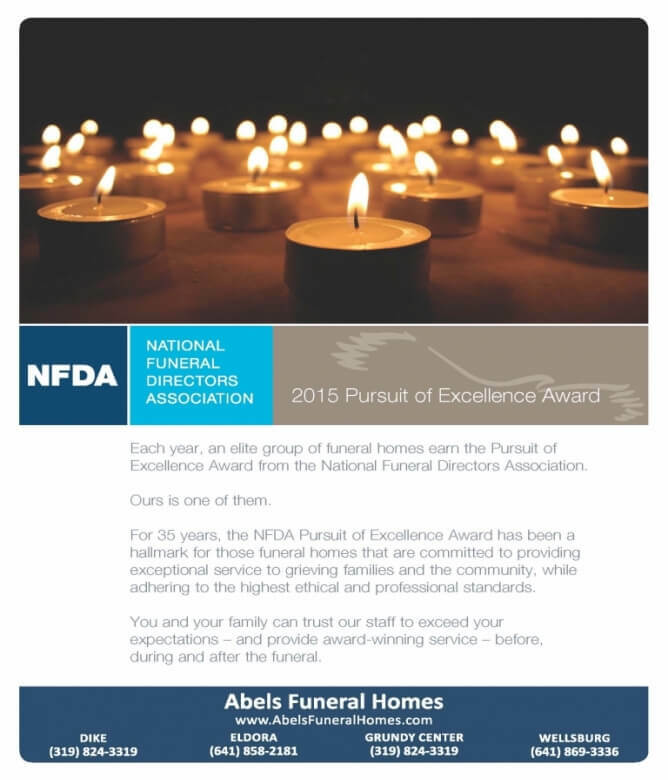 It is the 3rd year the funeral home has been recognized by peers for this achievement. To qualify, a funeral home must excel in four of five areas: presentation of public information, active membership in the state association, sponsorship of community events or services, professional development, and personal development. This year’s Annual IFDA Convention featured highly regarded local and national funeral service speakers who presented current information on bereavement education, business and management practices, regulatory updates, technical skills and training, and additional topics related to the funeral service profession. The Annual IFDA Convention provides funeral directors with a forum to receive and exchange information so they may return home with new ideas that will allow them to better serve the families in their communities. The Iowa Funeral Directors Association “promotes and supports funeral service excellence©” by representing over 700 Iowa licensed funeral directors and 413 funeral home establishments throughout the state and promotes high standards within the field of funeral service through continuing education programs, legislative representation and service to Iowa communities. For consumer information regarding funeral service, please visit IFDA’s website at www.iafda.org. 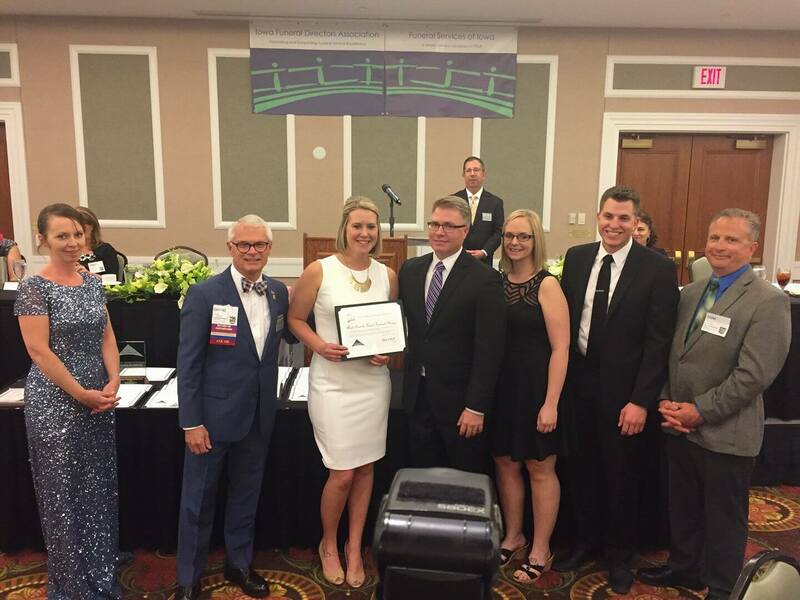 Photo: Abels Funeral Homes of Grundy Center, Dike, Eldora, Reinbeck, and Wellsburg received the Award of Excellence in Funeral Service for a 3rd year during the 135th Annual Iowa Funeral Directors Association Convention in May. L to R: IFDA President Jayme E. Lentz, Rebecca Camp, and William Camp.